Brooke Gladstone Since 1995, Brooke Gladstone has worked what still is a rare beat in broadcast journalism: she reports on the media. Currently she serves as co-host and managing editor of NPR's On the Media. June 22, 2012  The tourism website Mexconnect, claims that "The Mexican State of Veracruz brings to mind beautiful Gulf of Mexico waters, steamy jungles and mouth-watering seafood." If you read the news, it may bring to mind a turf war waged by three drug cartels, and a heap of mutilated bodies. May 20, 2011  Read an excerpt from Brooke Gladstone's The Influencing Machine. April 15, 2011  The audience for Egypt's Bassem Youssef Show is growing as fast as a snowball rolling down a hill — and it exemplifies everything that is new about media in post-revolutionary Egypt. November 5, 2010  Commentator Brooke Gladstone -- host of NPR's On The Media -- finds fault with MSNBC's decision to suspend the host of its most popular show after he made political contributions to three Democrats. "We all know true objectivity is a myth," she says. 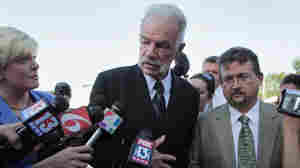 September 10, 2010  Media coverage of Pastor Terry Jones' plan to burn the Quran has been extensive. Brooke Gladstone, host of NPR's On The Media, says the story exposes more about American media than it does about the American people. December 15, 2006  In response to the growing power of religious extremism, a small group of atheists has taken a new approach. Going on the offensive, they target the tolerant, with both reason - and ridicule. Brooke Gladstone, host of NPR's On the Media, reports. The Tao of 'Star Trek'? September 8, 2006  The Star Trek science-fiction franchise turns 40 today. The original TV series only lasted three seasons. But in syndication, it became a viewer favorite, spawning spin-off shows and a series of big-budget movies. Brooke Gladstone, the host of NPR's On the Media, is proud to be a "trekkie." She explains the enduring success of the Starship Enterprise and its sister ships. April 6, 2006  Brooke Gladstone talks to Russian playwright and writer Edvard Radzhinsky about his book The Rasputin File, which explores the infamous faith healer who infiltrated the court of Czar Nicholas II. February 28, 2005  Some news organizations are giving extra thought to how they use words and phrases like reform, moral values, and war on terror. Brooke Gladstone of NPR's On the Media explores how some media outlets decide what to say, and how to say it. April 23, 2004  Brooke Gladstone, co-host of NPR's On the Media, explores the booming business of "chick lit" -- all those trashy beach reads with the pastel-colored covers. They've become so popular, there are sub-categories now: African-American chick lit, Christian chick-lit, and now even a more "manly" version known as "lad lit." Can a gal spend an evening reading chick lit and still respect herself in the morning? And will lad lit be an economic success? January 18, 2003  The $41 Kobe beef patty at Manhattan's Old Homestead Restaurant is the most expensive hamburger in New York City. Is it worth it? Hear from NPR's Scott Simon and Brooke Gladstone, host of NPR's On the Media. 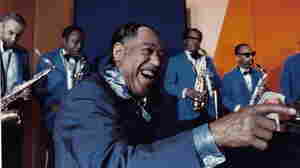 June 12, 2000  "Take the 'A' Train" started the lasting collaboration between Billy Strayhorn and Duke Ellington.